What happens when you have several users accessing multimedia applications all at the same time? No need to worry as 71X6-00124 allows you to move large files faster and easier. Transfer your CGI, CAD, video, or other large multimedia files over the network instantly and without lag. 71X6-00124 features a non-blocking switching architecture that forwards and filters packets at full wire-speed for maximum throughput. With MAC address auto-learning and auto-aging, IEEE802.3x flow control for full-duplex mode and backpressure for half-duplex mode, you have powerful features sending your data throughout the network. 71X6-00124 is plug-and-play so no configuration is required. Providing auto MDI/MDI-X cable detection on all ports eliminates the need for crossover cables or Uplink ports. Each port can be used as general ports or Uplink ports, and any port can be simply plugged into a server, a hub, a router or a switch, using a straight cable or crossover cable. Diagnostic LEDs which display link status and activity, allowing you to quickly detect and correct problems on the network. 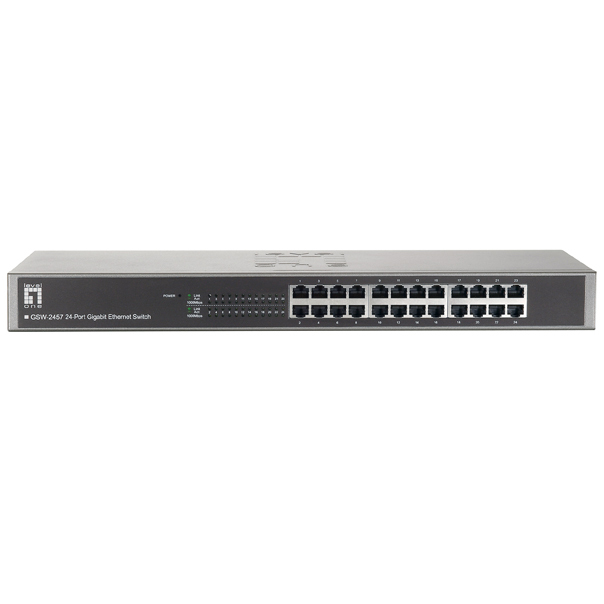 More Product Info71X6-00124 is a 24-port Gigabit Ethernet Switch that gives you a high-performance, low-cost, easy-to-use, seamless upgrade to boost your network to 1000Mbps. Increase the speed of your network backbone to a massive 48Gbps and bring lightning fast Gigabit connections to all your computers.